The shelf life of Windows Media Center has been a much-discussed topic. Many questions were answered when Microsoft included Media Center in its Windows 8 Consumer Preview. The app exists for all intents and purposes exactly as it does in Windows 7; a Desktop Layer application. Some have pondered how Media Center could exist in Microsoft’s new Start Screen environment (which I will call the “Metro Layer”). Folks like Josh Pollard at the Entertainment 2.0 podcast envision a situation where Media Center’s core, unique DVR functionality could be split into three or four Metro Layer apps. The the remaining functionality (like Photos, Music, Netflix, etc) will exist in their own Metro Style apps that are already being built. I love this idea, and have gotten the essentials of this concept to work. By using some shortcut coding that has been on the internet for a few years, we can create Metro Layer shortcuts that deep-link into Media Center’s modules. Then I right-clicked on each shortcut and selected “Add to Start Menu”. This creates a generic Metro Layer shortcut button for each. Finally, I moved the buttons to my Media group of icons in Metro. The resulting shortcuts allow the user to access the Guide, Live TV, and Recorded TV (respectively) with a remote control on the Metro Layer. (I do not have a tuner set up on this machine, however, so I can only guess that the Live TV shortcut does indeed work). There are a couple of caveats, however. One needs to place a Windows button on their remote control in order to return to the Metro Layer. This is easy for Logitech Harmony remote controls. The dedicated Media Center remotes, however, don’t have this button, and their green buttons take the user back to the Start screen in the Media Center environment. In order to return to the Start Screen one has to arrow down to Settings and Close the Media Center app. Additionally, these shortcuts, and the Windows 8 Metro experience do not convey to extenders, and that is something that will never be developed, unfortunately. In the Windows 8 era, extenders will still remain fully in the Media Center environment. The only other shortcoming in my in vitro test is the unsightly generic icon used for shortcuts in the Metro Layer. Presumably Microsoft will add the ability to customize Metro Layer icons which would enhance the user’s experience in this UI. Certainly the code level deployment of a separated Media Center would be offer a reason for Media Center users to upgrade. In its current condition Windows 8 offers nothing to dedicated Home Theater PC users that isn’t available in Windows 7. However as Metro Style apps get developed by media outlets such as Netflix, YouTube, HBO, Hulu, and others, HTPC users will increasingly find themselves wanting to be in the Metro Layer. A graceful entrance to and exit from the Media Center environment would sustain Windows Media Center as the premier DVR experience in the market. 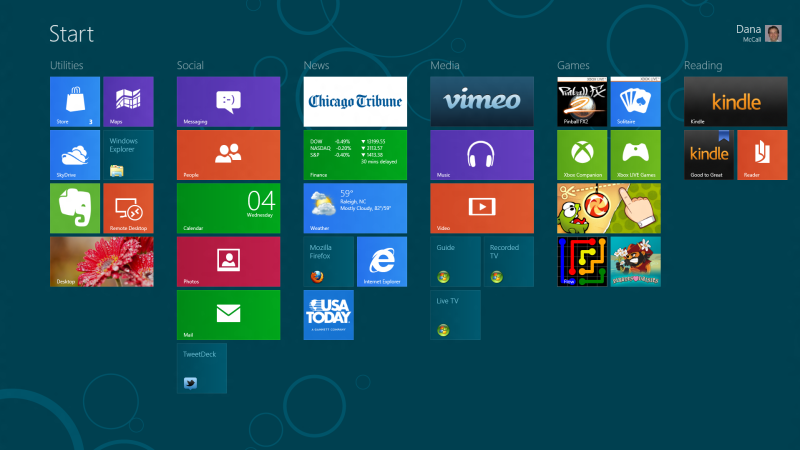 Until then, though, a little bit of work with a PC can give us an workable experience in Windows 8.